There are so many fabulous fashion ideas to follow this year. 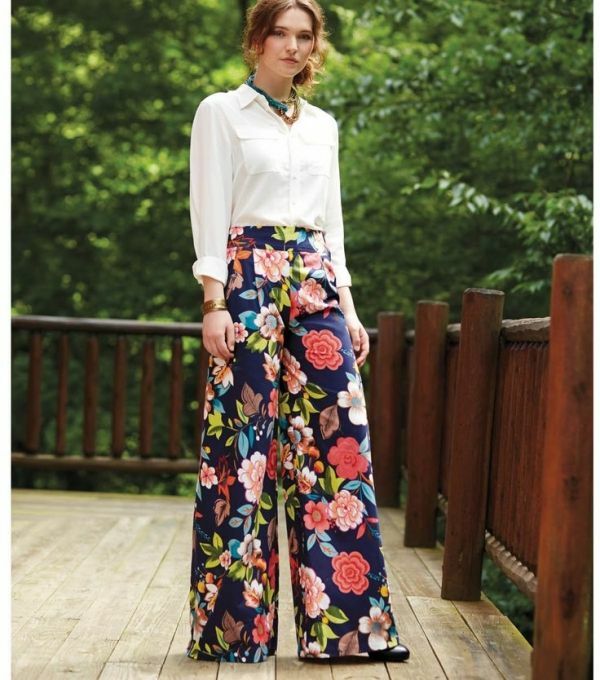 One of my favorite trends is floral pants. They are so on trend this year. No matter if you wear them to work, parties or simple day walks on the town, believe me, you gonna look fantastic. I’ve got you covered with the latest styling ideas and floral print designs to try on this year. Be sure to wear comfortable floral bottoms. It’s important to look and feel perfect in these bright pants. 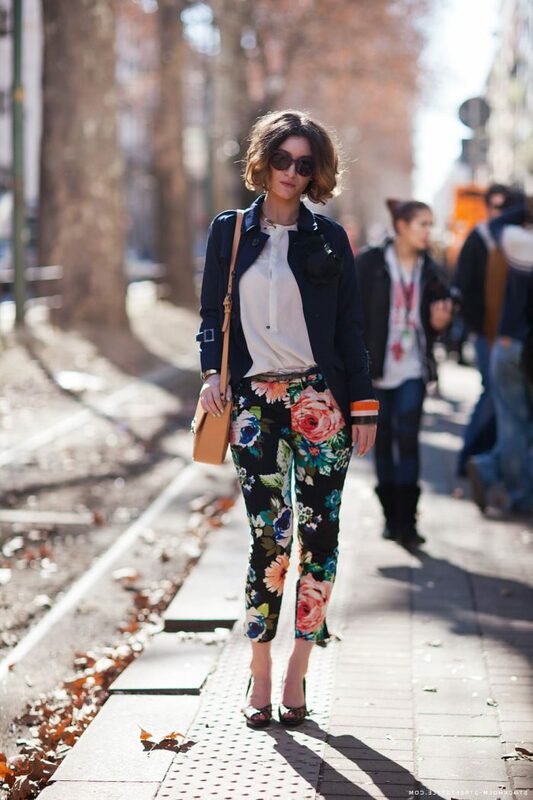 If you don’t want to wear brightly blooming bottoms, then go for navy styles with occasional floral print. Personally, I like bright looking clothes, that’s why I adore wearing white skinnies in sweet colored flowers in orange tones. If you do sports, then I highly recommend to add some florals to your workout clothing, like floral yoga pants. 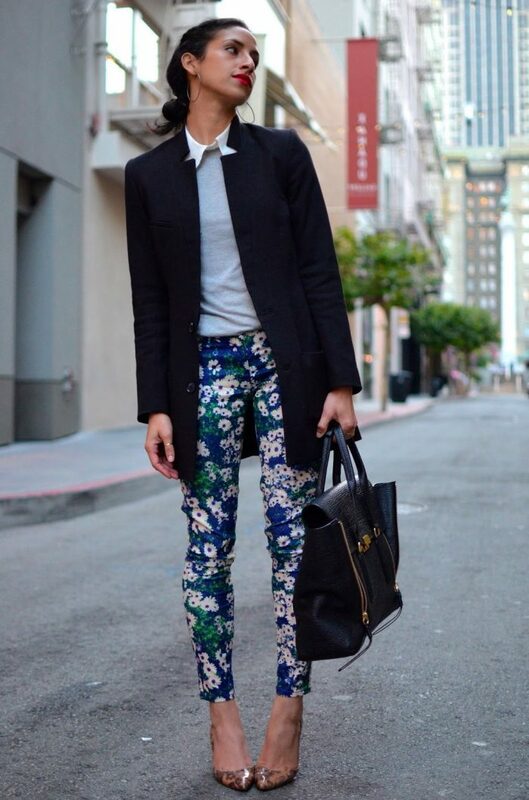 If you are just a beginner and you do not know where to start, then go for darker base trousers with bright florals. If you are risk taker, then you better try on high-waisted wide-leg floral pants that will add a little bit of drama to your overall look. You can always mix up patterns, by teaming floral skinnies with cheetah print heels. Or you can make it contrary, by keeping things solid up. Pair your florals with a solid color tee and heels. Don’t forget about your body type, if you are petite, you will want to go for a smaller pattern, if you are tall, then you might like to wear large-scale patterns. There are so many beautiful ways to make your blooming trousers look insanely hot, just scroll down your mouse and see all my favorites. A big ribbed knit sweater in white can be half-tucked in gorgeous dark floral pants completed with light gray ankle boots. This outfit looks so 1970’s inspired. By the way, check out my post about Summer knitwear for women that can be worn during Summer months. You will find plenty of awesome ways how to make knits look great and stylish. A kind of sweet off-duty style outfit is seen below. 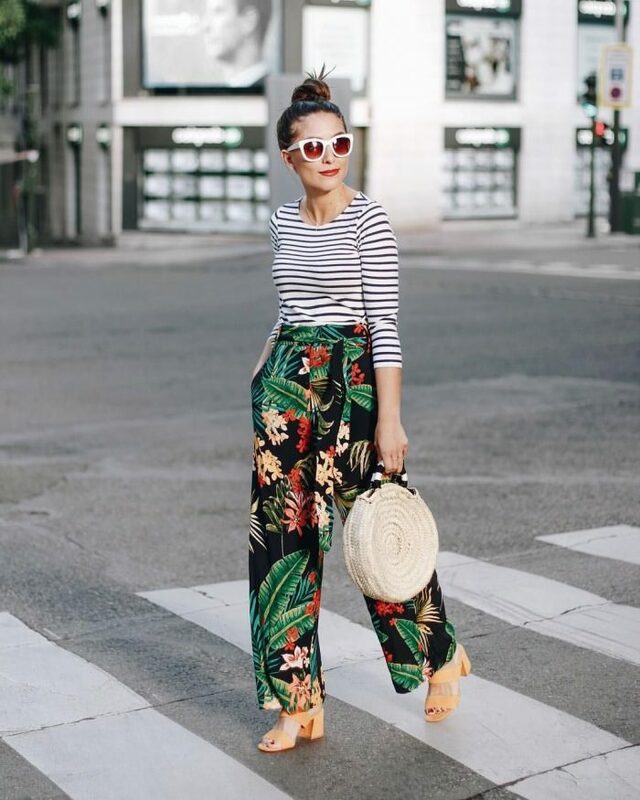 Lady appears in black-white striped top tucked in jungle floral print black trousers completed with block-heel sandals, rounded straw bag and white sunglasses. Speaking of stylish combos, I highly recommend to check my post about off-duty style for women. You are about to see lots of simple and easy to style ideas how to make your clothes look fresh and relaxed. 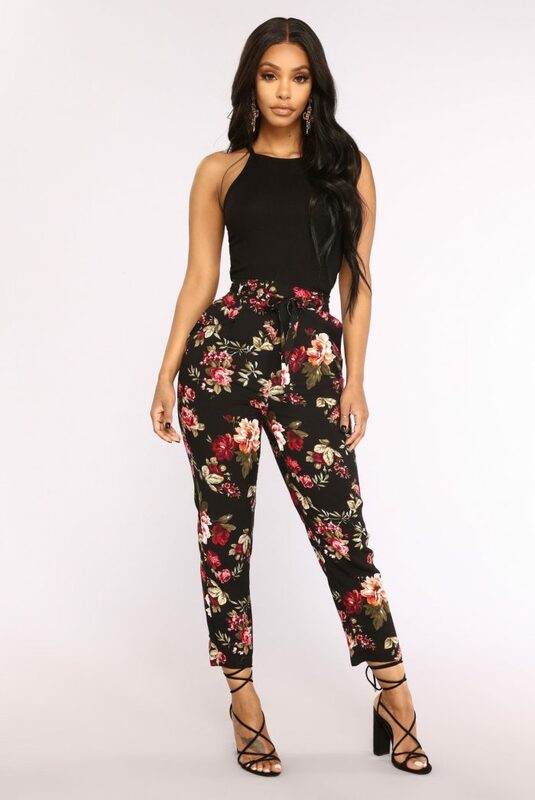 Do You have any thoughts about Best Women Floral Pants? Here are Fashion Tips pictures and trendy women’s outfits which are in style in 2019: Best Floral Prints And Patterns, Fashion Print Trends, Floral Pants, Must Have Fashion Trends For Women, Street Style Women's Fashion And Inspiration and tips on how to wear them on the streets.